Ctra Nacional 340 km 260, 29749 Torre del Mar, Spanje. 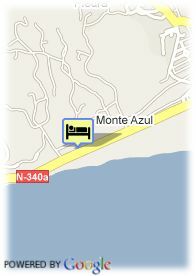 Hotel situated in Almayate Bajo, at 18 Km from Torre del Mar. 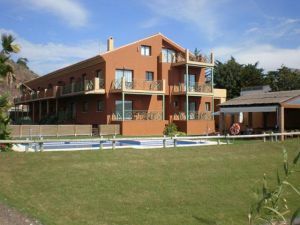 Built in August 2007, the aparthotel Axarquia Beach offers 30 rooms with air-conditioning and heating, terrace or balcony, TV via satellite, cordless access to Internet. The rooms are situated on the first beach line, so close to it, that is not necessary to go out the hotel to access the beach. Some of the rooms have excellent views to the bay. Situated in an almost unexploited part of the Sun Coast, named "la Axarquía" surrounded by picturesque white villages, like Frigiliana, Torrox, Competa, which still perserve the charm of the inner Andalucia and represents the right place to imagine different rural routes, the region offers a great number of leisure activities, including golf courses and water activities in the sports port. It represents a new concept in the region, offering a comfortable, elegant and well designed place to spend some quiet holidays next to the sea. Betalende overdekte parking aan het hotel (6.42 €), Reservatie verplicht.